Burn audio DVD easily on Windows and Mac. Burning Audio files is always a good idea when it comes to creating a backup of these files. But, finding software which is capable enough of withholding the files quality and burning them to some other data disc with the same quality is very hard. The users will need a strong Audio DVD Creator for Windows 7, 8, 10 and also for Mac.So, in this article, we are going to discuss the Wondershare DVD Creator which can easily burn DVD audio in Windows and Mac original system. Along with this, we will also determine the possible ways to burn DVD the Audio files on Mac and Windows with some other software program. The Wondershare DVD Creator is very popular software to burn audio DVD in Windows 10 and other versions too. 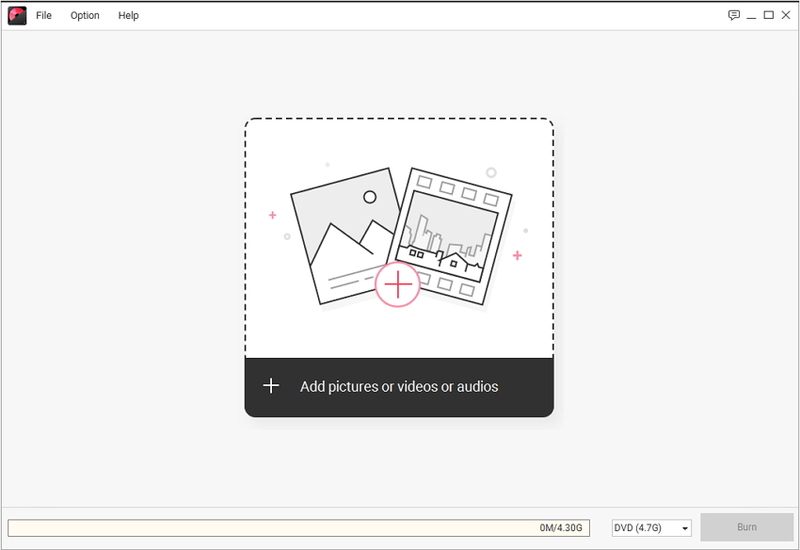 This utility toolkit satisfies all the needs of the users, whether they want to burn an audio file, a video file or photos, the software will do it all. It has a wide array of format support of audio files as well as of another kind of data too. It also offers some other sub tools to perform other operations on the media files. Visit the official website, click on the download option and install the software on your computer. Once the Wondershare DVD Creator is installed on your computer, launch it and its homepage will open up. From the homepage, tap on the Data Disc option and you will be directed to another screen. In the next screen, you will see a big “+” icon. Click on the icon to add the audio files that you want to burn on the DVD. You can also drag the audio files and drop them into the software interface. Note: You can add multiple files at a time and can also delete the files which are added by mistake. Once you are satisfied with the number of files, give a label to the disc. Also, select the burner which you want to use and then finally tap on the Burn option. This will burn the audio files into the disc as soon as possible without any quality loss and you will have a backup of all your audio files. Apart from the audio files, the Wondershare DVD Creator can burn over 150 different types of format to CDs, DVDs, Blu-ray disc and all the other popular types of discs. 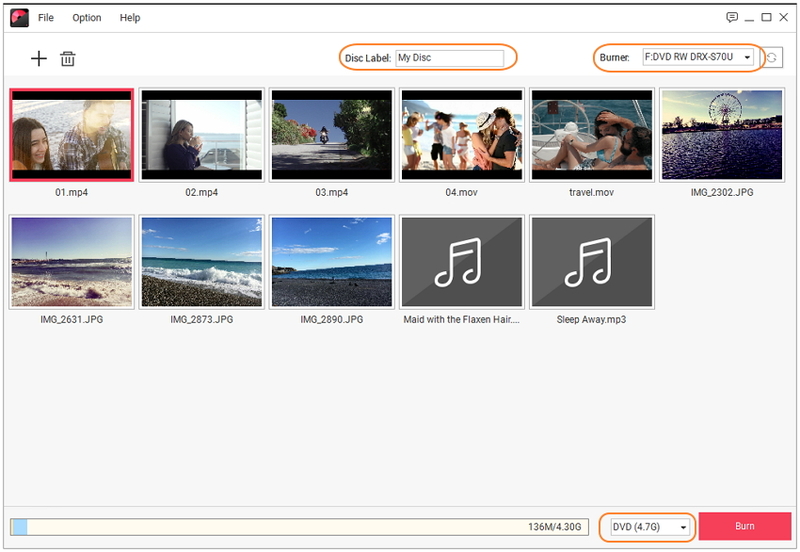 Apart from the Wondershare DVD Creator, you have another option to burn the audio files to a CD or DVD. The Windows File Explorer can also burn an audio CD in Windows 10/8/7. 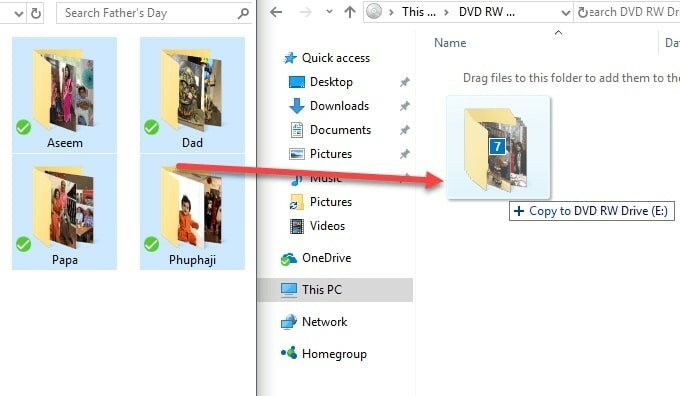 The File Explorer is good enough to burn the CD and DVD both but the process also depends on the files and their quality. Step 1 The first step is to insert a Blank CD/ or DVD in the drive. An AutoPlay Windows will open up. From that window, select the Burn an Audio CD option. Note: If the AutoPlay window doesn’t appear, then go the Computer and right click on the Drive and select open. 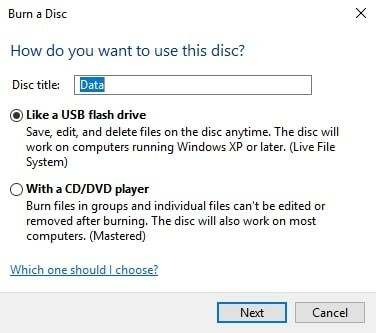 Step 2 Give a name to the disc and select how you want to use the disc. You can choose any of the options according to your preference. Once you have decided the format, click on the Next button. 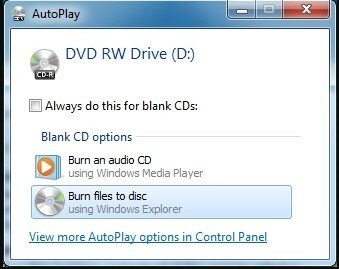 Step 3 In the next window, you will be able to add the files that you want to burn to the CD or DVD. You can use the drag and drop method or right click on the files and then select the Send to option to send the files to the disc. You can add the files to disc as long as there is space left on the disc. Step 4 Now, tap on the Burn to Disc option right below the toolbar and a new window will open up where you can specify the burning speed and edit the name of the disc. The process will take some minutes to complete the burning. You will get notifies when the burning fishes and the Explorer will also give you an opportunity to burn the same files to another disc. Using the File Explorer seems like the easiest way to burn the files, but the Explorer usually burn the files at a very slow speed. That’s why the users try to find software which can burn the files with quality and speed both. The Mac OS can’t burn the Audio CD/DVD without the help of the iTunes. But here, we are going to use some other software that allows the users to burn the audio files. The mirethMusic is specially designed software for Mac that allows the Mac users to play with the audio files in the most interesting way. It is an audio DVD Creator for Mac which can perform various tasks like ripping, burning and playing the audio files. Step 1 At first, you require three essential components which are a mirethMusic application, Music files and a data disc on which you want to burn the files. Once you have installed the application on your Mac, launch it and click on the Burn tab. Step 2 Now, it is time to select the audio files you want to burn. You can use several methods to select the files. The first one is the single click, the second one is the Shift+ click and the third method is to press the Command key+ click. This will select the files from the Library and add it to the software interface. You can also drag and drop the files from the Finder into the software. Step 3 Once the files are added to the software interface, a music format popup will appear where you can decide in which format you want to burn the audio files. Step 4 Finally, tap on the Burn DVD-Audio option and all the files will be burnt to the disc as soon as possible. The mirethMusic will burn the Audio files to DVD, but the users have to remember that there are many features that the software doesn’t have. It is not intended to be a professional tool and can only perform the simple and basic task of burning requirement. After reading the article, it might be obvious that even if there are so many softwares available for both the Windows and Mac OS, the obvious choice is the Wondershare DVD Creator. Whether you want to burn an audio CD in Windows 10 or burn DVD audio on Mac, the DVD creator will do it all for you. So, instead of opting for some inbuilt software which lacks in many features and functions, it is better that you try the Wondershare DVD Creator. Go, download the software now and take the benefits of the software by easily burning audio files and other files quickly and easily.